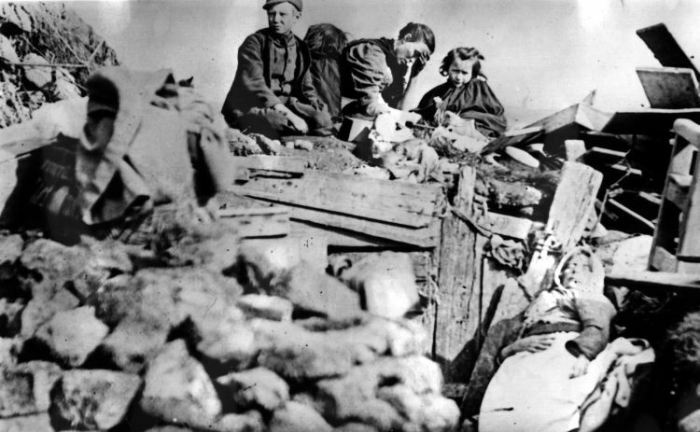 ‘The Highland Clearances’ have been described by Ewen Cameron, William Fraser Professor of History at Edinburgh University, as “one of the most evocative and symbolic but least understood episodes in Scottish History”. (Cameron 2001: 97 – full references can be found at the end of part two of this article). Ray Burnett’s contribution to our understanding of this episode, published on Bella Caledonia in August 2014, is an ambitious and uncompromising one. Class struggle, he insists, is the only relevant factor that we should consider when making sense of the political struggles of the clearances and the land risings. As evidence for this claim Burnett presents an account – he calls it a “diagnosis” – of the Gàidhealtachd in the 19th century; an account which works solely on the basis of class analysis. In this account he repeatedly excoriates alternative positions which suggest that the struggles might also have been informed by distinct cultural norms belonging to Gaelic Scotland, or by the sense that Gaels of the time might have considered themselves a distinct people within Scotland. Burnett unequivocally rejects the possibility that any factor other than class – such as language, culture, religion or sense of nationhood – could have played a meaningful part in the political oppositions and alliances of the period. However, the article’s ambition extends beyond providing a “diagnosis” of the past. Burnett weds his class determined analysis of Highland history to his beliefs about how historical evidence should be used to inform political struggle in the present. Indeed, his historical analysis is the product of, and a contribution to, a theory on the use of history for political action in Scotland today. Burnett’s article can be read as a praxis in which this theory, with his “Highland case-notes” as evidence, is employed to prescribe a doctrine for correct forms of radical political action and association in Scotland in the run-up to the independence referendum. In the first part of this article I will examine the ideological underpinnings of Burnett’s theory and explore some of the contemporary cultural and political consequences of his position. The second part of the article will test whether the “Highland case notes” out of which Burnett creates his diagnosis are, in fact, a reliable description of the historical record. Because Burnett has made his political theory dependent on the historical evidence, the ‘case notes’ test will allow us to determine whether his prescription for radical political action and association in Scotland today is warranted. This is a rich ideological statement and one which is worth close examination. As a political theory on the use of history it holds that when using historical evidence for political ends any “cultural historical referents and memories” which are found to belong to a particular cultural group or people within Scotland must be disowned and discarded for the sake of a ‘national collective’. Therefore, Burnett’s view of radical political discourse in Scotland appears to be that any contributions which, for instance, seek to raise awareness of, or act on behalf of, a distinctively Gaelic voice and polity should not be permitted. This is because, in Burnett’s opinion, these would not support “the agenda and the resources” of the Scottish left and their particular struggle for freedom in the contemporary world. Adherents to this line of argument seem to believe that Scotland’s future national freedom will be compromised by giving cultural minorities a political voice. Indeed, Burnett warns that even to propose that within Scotland today there exists a “division over ethnie or language” or “over ‘native’ or ‘foreigner’ is debilitating and damaging”. Burnett concludes his article by cautioning radical young Gaels, such as Dòmhnall Iain Dòmhnallach and Aonghas MacLeòid, against research and activism that develops a politically interested understanding of “Scottish history…seen through Gaelic eyes”. (MacInnes 2006: 267). Burnett claims this would represent a return to “essentialist binaries of the past” – such as the distinction between ‘Gael’ and ‘Gall’ or ‘Highlander’ and ‘Lowlander’. In making this claim he takes a stand against this new wave of young Gaelic scholars and writers who are placing culture at the heart of political struggle. Such explorations offer new perspectives and ask new questions about the nature of Gaelic identities, and of the status of Gaels in Scotland today. As a people, Gaels have been described in national terms. One of the foremost Gaelic scholars of our time, John MacInnes, believes the historical experiences of Gaels in Scotland can be understood as the experiences of a nation. He concludes that Gaels exist today as “the detritus of a nation”, the result of what he calls the bewildering chaos caused by the break up of traditional society during the 18th and 19th centuries. (MacInnes 2006: 266, 385) Elsewhere in his important body of work MacInnes has shown how the historical roots of the processes that destroyed Gaelic social and political formations – formations that from the vantage point of the 21st century may be considered as ‘national’ in character – can be traced back much further than the 18th and 19th centuries. This point is crucial if we wish to understand one of the serious flaws in Burnett’s work – the lack of discussion of pre-18th century political events in the Gàidhealtachd. Because Burnett’s argument is predicated on class struggle, his writing can find no place for this longer view of history. As a result Burnett’s account is most significant for radical thought in Scotland not for what it contains, but for that which it appears to seek to prevent. He uses his political theory on the use of history, outlined above, explicitly to seek to prevent the development of a radical Gaelic perspective on the past history of the Gàidhealtachd, and to prevent the emergence of a radical indigenous political voice in the present. Burnett, for ideological reasons, opposes this transformative moment because he fears that any distinctive forms of Gael self-understanding and development would be “damaging and debilitating” to his vision of a future socialist Scotland and should, therefore, be considered subservient to and discarded in favour of a pan-Scottish left political identity and movement. that political opposition to clearances was determined by class interests and other factors, such as Gaelic culture, are irrelevant. If these three claims hold true then, in Burnett’s view, Dòmhnallach, MacLeòid and others should turn their attention to nurturing the future of an organic left in Scotland using only “shared cultural historical referents and memories”. Because of the ambition of his argument, and the cosmological consciousness he seeks to close down, Burnett’s three claims require close scrutiny. In the second part of this article I will examine and test each claim in turn. See Part 2 of this article (2 articles up in the thread) for various comments. inntinneachd ach ca’ bheil part 2 ? Reblogged this on Sgitheanach an cuir à dùthaich.